Bring more data: MIS MARKET MOVES 2017: 860 schools switched MIS in the past year! MIS MARKET MOVES 2017: 860 schools switched MIS in the past year! The English state school Management Information System (MIS) market is a peculiar beast. Nearly all schools buy a MIS, and larger secondaries can pay £10k+ for the pleasure, so there's proper folding money involved. I'd guess the total market is worth comfortably over £100m, and that juicy figure has led 15 companies to offer a product in the space in the past 8 years. And yet, in spite of the healthy competition, until a few years ago the only real takeaways from an analysis of the data were that SIMS remained huge, and schools don't like switching. 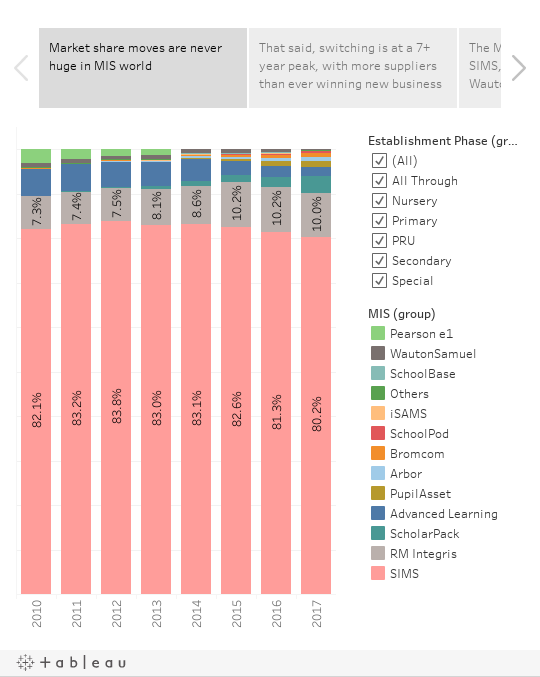 In 2012 for example, just 1.4% of schools switched their MIS (300 out of around 21,500 for whom we have data), implying that the average school was on track to stay with the same supplier for around 72 years. And to be honest, the 2011 and 2013 markets weren't much perkier. But more recently, the market has finally shown signs of life. Over 600 schools have switched MIS in each of the past three years, with the number peaking at 860, or 4% of schools, in 2016/17. What's more, the competition is now fiercer than ever. Consider this: in 2011, only one company managed to win more than 30 new schools (SIMS, naturally, who gained 262 that year). Even as recently as 2014, only four got over the 30 school threshold. However, in 2017, fully 8 suppliers topped that number. Schools want the cloud. Some 4,000 schools are now using a cloud MIS, up from 3,000 only two years ago. With SIMS now fully on the cloud train, this is set to shoot up in the next couple of years. Mind you, until now a move to the cloud meant a move away from SIMS; so it's hard to know what effect SIMS's cloud conversion will have on switching numbers. Multi Academy Trusts (MATs) are flexing their purchasing muscle. Increasing numbers of MATs are choosing a single MIS to use across the trust. Others are allowing for differences, but make their schools choose from a framework of preferred suppliers. MIS vendors are differentiating themselves more and more. As I wrote in August, Scholarpack focus on primaries only; Arbor have gone big on data analysis, SchoolPod promote their low price, and Bromcom are flaunting their suitability for MATs. A prominent person in the industry recently challenged me to dive into the data and look at how likely switchers were to stay with their new MIS. I have spent way too many hours down this rabbit hole, but my conclusion is that in general, once schools switch, they stay switched. Of the 338 schools who appear to have switched more than once in the past seven years, I could find only 45 instances of a school returning to their former MIS. And from the remaining 293, 220 were forced to switch at least one of the times (for example when Pearson e1 left the market). Furthermore, I can't see any evidence of a supplier that is more prone than others to winning, and then promptly losing, business. This should offer encouragement to the challenger brands: school business may be hard won, but once a school has made the move they are unlikely to want to shift again any time soon. In a sense therefore, the MIS market is to edtech what current accounts are to banking. A final postscript for those geeky enough to read to the end: as Keith Johnson (of Timetabler fame) correctly pointed out in the comments on my last post, the data used for this blog covers only English state schools, which means that MIS which are popular with independent schools (such as iSAMS, SchoolBase and WCBS) are missed out of the analysis. Sadly that's a hard gap to fill since I use FOI-ed public data, and there's no equivalent source for the Indie sector. It's also worth noting that the data excludes Welsh schools (who mostly use SIMS, with a notable minority using Ceredigion Teacher Centre) and Scotland (where more or less all schools use the council-owned SEEMIS). Thanks for writing this, Joshua. Another reason for schools switching MIS is to do with the change from being a school to being an academy (whether within a MAT or standalone), as this forces them to relicense their MIS - and some opt for a change/ cheaper product. If the advent of the new version of SIMS next year also requires a relicensing process, this may become a critical inflection point for the market. Finally, I probably wouldn't go as far as saying "schools want the cloud" but they certainly want mobility from their MIS, and the cloud is price of that. On the last point, why wouldn't you say "schools want the cloud"? I'm inclined to think that schools shouldn't be managing servers (if they can help it) any more than they should be generating their own electricity... but I accept not every agrees! Interesting - what's the legislation you're citing here? Hello Joshua, thank you for a very interesting read this morning. As a first time reader, I was wondering where is this data sourced from, yes public FOI but from which month? In your conclusion, you said 'I can't see any evidence of a supplier that is more prone than others to winning, and then promptly losing, business.' Do your figures for Advanced Learning say different? Is the market anticipating another buy out here? Hi! This is data from the autumn school census, so Oct 2017. I didn't notice a significant difference in the trend for Advanced, to be fair to them, but then I didn't look too hard at their stats either. Their big win was (AET), who are to my knowledge still with them, so that's a notable contract to watch. As for whether the market anticipates another buyout, I try to stick to presenting the facts (since my day job involves being friends with all suppliers!) rather than speculate... Sorry! How do I make a register?